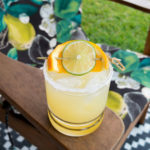 Easy 4 ingredient lite margarita recipe. Perfect for a low calorie cocktail option. In a cocktail shaker full of ice add in the tequila, lime juice, orange juice, and agave. Shake for 20 shakes and strain into a low ball filled with ice. Garnish with a lime and orange wheel. The key to keeping these lite and low calorie is to use fresh squeezed ingredients. If you'd like a frozen version. Add the ingredients into a blender with a 1/2 cup of ice. Blend until you reach your desired consistency. If you want to flavor it, just muddle some fruit in the bottom of your shaker before you add the ice in. You can make anything from strawberry to mango margaritas this way!